I had a couple of different pizza joints all lined up to review, but I just couldn’t help myself. I made a quick return to the iconic, Italian Gardens, yesterday. It was on another spiritual level like the aforementioned visit. This time I ordered two, which ended up being three, large thin crust pizzas to go. It was an inspired idea, based on nothing but, well, inspiration. I raved about the cheese slice last time, but this was my first ever experience with their white pizza. And oh my goodness, this is on that same level. Absolutely incredible. I am used to having three cheese white, but with this one, sans parmesan, is a monumental experience. The combination of mozzarella, ricotta, basil, garlic, tomatoes (oops more on that in a few sentences), and their homemade olive oil sauce is something special. The latter puts it over the top. If anyone knows what’s in it, please let me know? Or maybe it’s best kept hidden. I haven’t given a enough credit to the crust either. The taste, crispiness, and crunchiness of the dough is flawless. I initially placed a call ahead order, for one white and one cheese. I inadvertently forgot to say no tomatoes on the former. Now I love them, but I prefer the pie plain. When I got there, I did check my order and saw my mistake. I offered to pay for the order, sans fruit, but they gave it to me on the house. 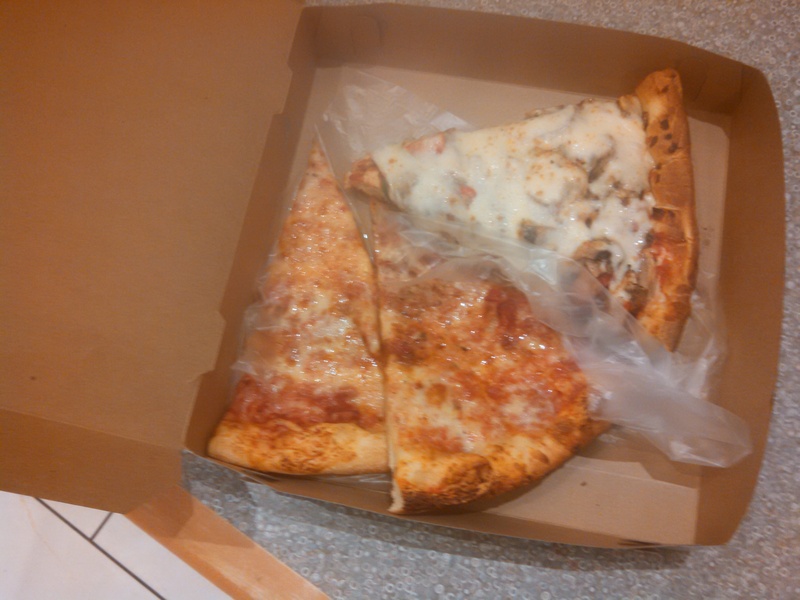 As before, with giving me two cheese slices for the price of one, they didn’t have to do this. The service here is top notch, on par with their pizza. And it may even taste better with those pesky tomatoes. I can’t remember having magnificent experiences at any dining establishment, consecutively. I am heaping some major praise, but believe me, this is warranted. It will be a while (well maybe) before I do another recap of this legendary pizza establishment. But, take my word for it, this is worth the drive. Pictured above is the three orders. Yes, folks were starving before photos could be taken. It’s that good. In the next calendar year, I will have other pizza places to recap and other fun pizza information. Hopefully a little something for everyone. Oh and go to Italian Gardens. 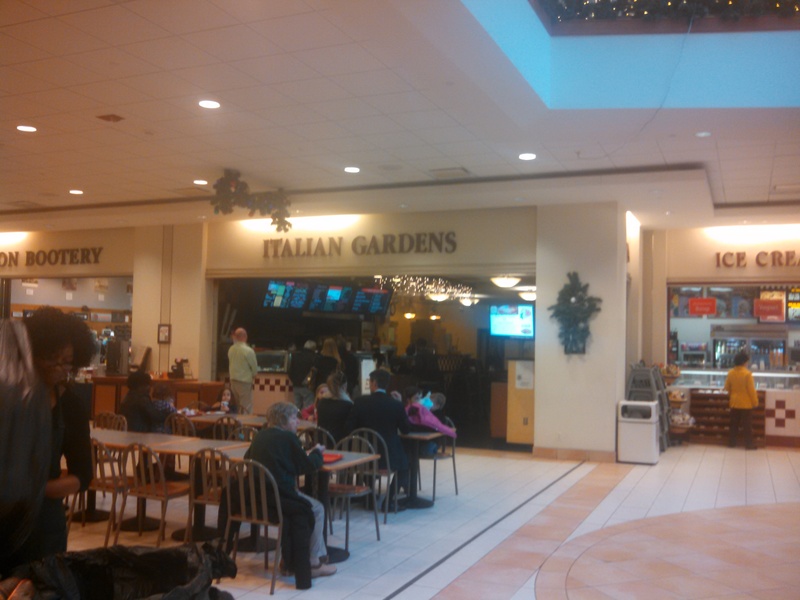 I paid a visit to Italian Gardens in Towson, MD yesterday. The charming location inside the Shops at Kenilworth, make this such a folksy place with a small town feel. 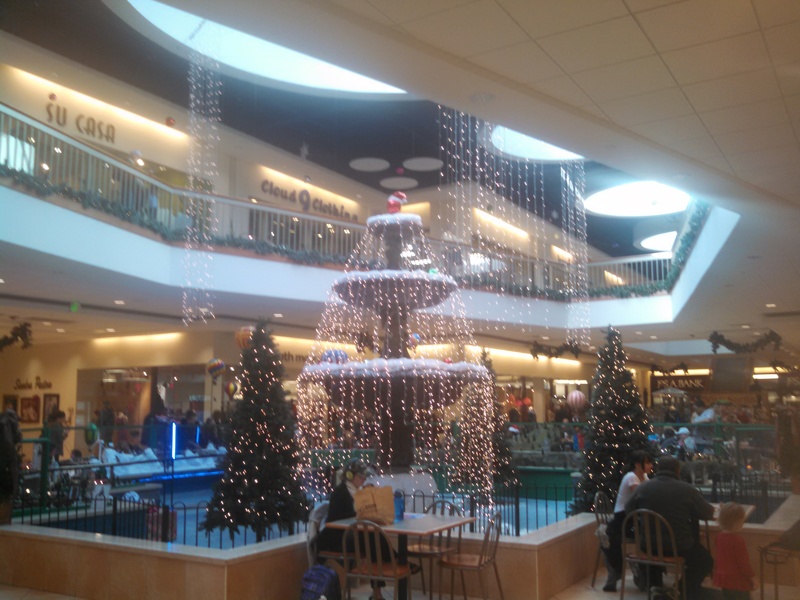 No matter what part of the mall, albeit tiny, you’re in; the aroma does permeate throughout. In my opinion, this may have the best slice of cheese pizza I’ve ever had. Sometimes it’s not always how a food tastes, but the whole aura surrounding a pizza place, can really enhance the joy of eating a pie. This is the embodiment of that. I’ve always had a good experience here. And the little things go a long way. I ordered one cheese and one Chicago Style Stuffed vegetable pizza slice. They gave me an extra cheese because they felt one was too small. Now that may seem like a little thing, but that’s going above and beyond. They didn’t have to do that. I am very appreciative of that act of generosity. The original cheese tastes like pure heaven. I don’t think words can do it justice. There are no over the top ingredients or anything Artisanal about this. 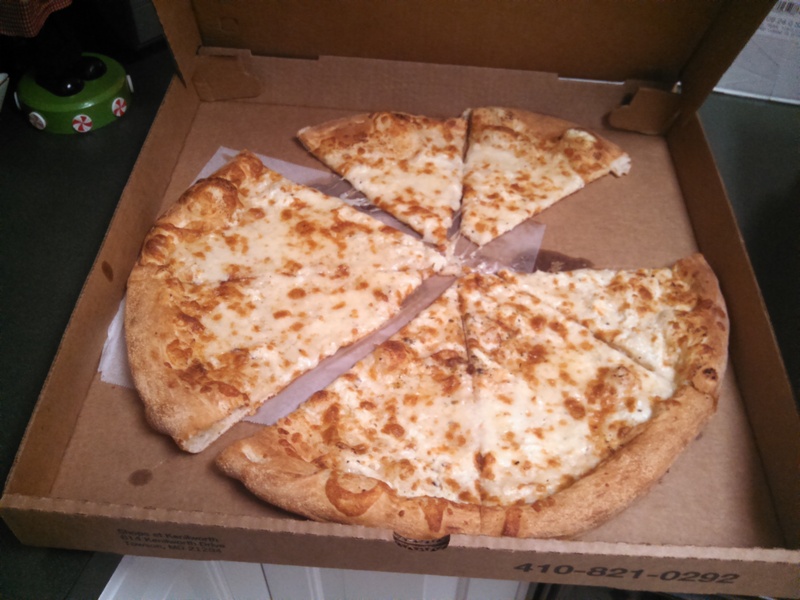 It’s a great cheese pizza that is too good for words. I have spoken very highly of this place to my friends for a few years now, and yesterday only validated that fact. This is a can’t miss slice. The vegetable pizza was very good as well. I would put it a notch or two below the cheese. The mall itself is older and may be revamped down the line. But, in it’s current form, it adds to the charm of having Italian Gardens located where it is. And with the current Christmas set up, I was happy to take in, not just the pizza, but the whole experience itself. Pizza tastes just that much better when the energy around you is positive. Everything about my visit yesterday was perfect. I hope to be back soon and review another offering from this stellar pizza joint. I am very serious. The cheese here is nearly unbeatable. Incredible. This will be the first post of the the Pizza Pals. Currently I am the only pal posting. So hi. I don’t know where this blog is going, other than when I encounter a new pizza place or something pizza related, a post will follow. So there could be two days between posts or two weeks. I went to The Arthouse in the Hampden neighborhood of Baltimore last night. It was my only my second time visiting. The first time was earlier this year and I thought it was incredible. I honestly don’t remember what pie I had. But I loved it. Maybe I had massive expectations the second time around. 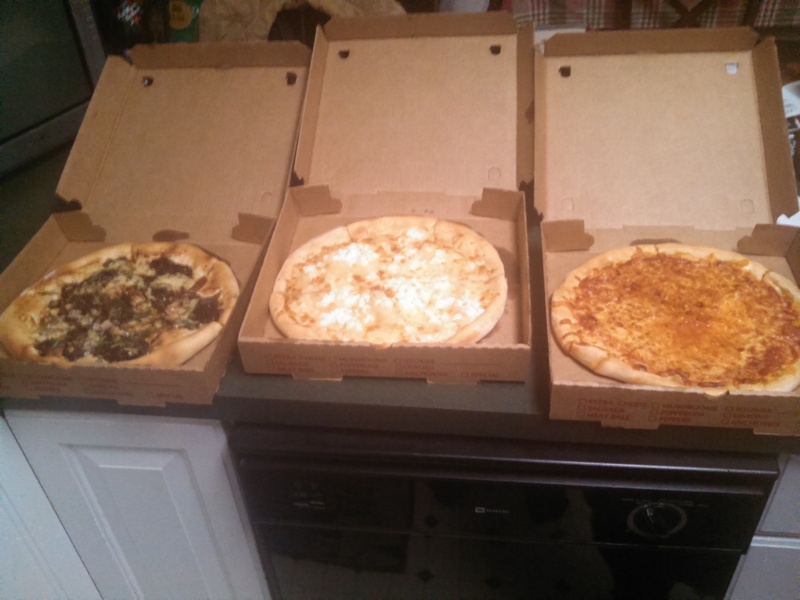 The three pies purchased are pictured above – Cheese; White; and French Onion. The latter to try something different. 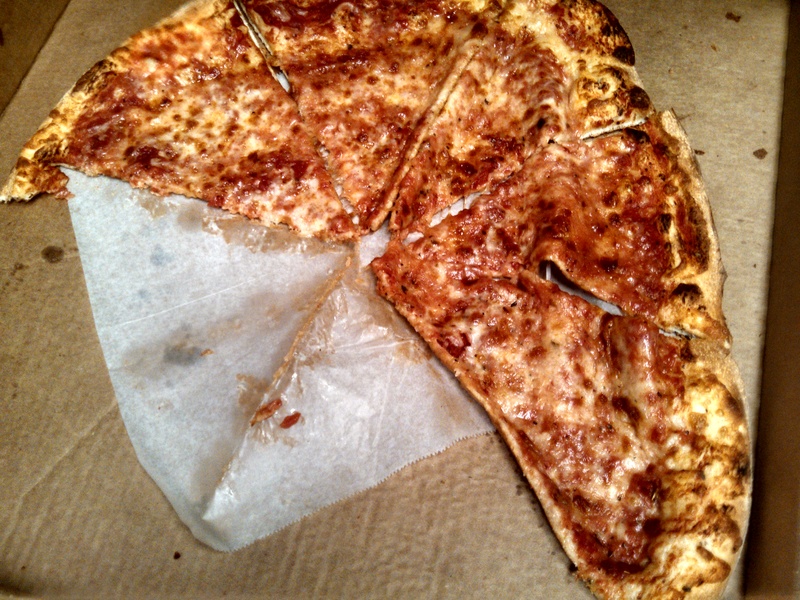 I thought the cheese was decent, but I have had better slices at local pizza parlors near my house. This is not to discredit this pie. Something just seemed missing here. It was a notch below what I feel a pricier restaurant pie should be. 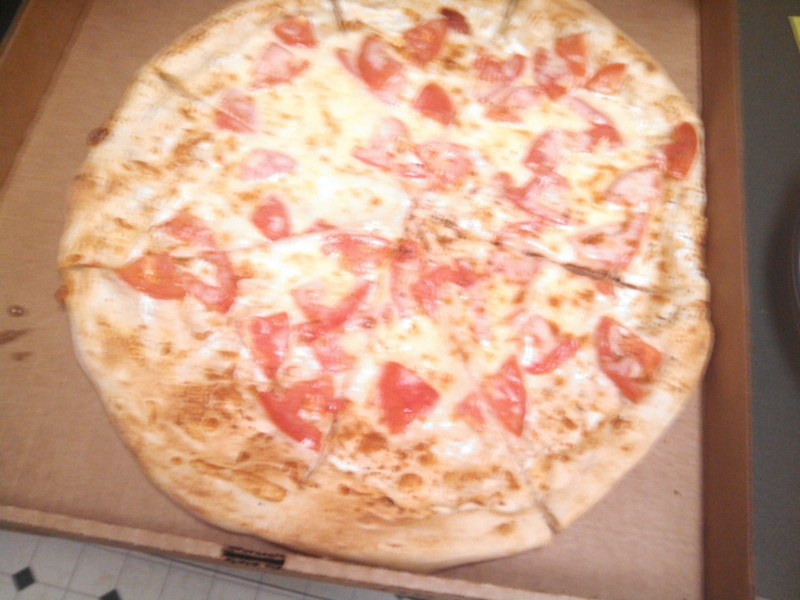 The white pizza was really tasty. I have never heard of white sauce referred to as Behamel Sauce. So that was pretty cool. With the Ricotta, garlic sauce, and mozzarella mixed together; we have a great combination. A very tasty medley of flavors. The French Onion tasted just like the soup. It was a very creative idea. The caramelized onions were delicioso. The chives were a nice touch and I could really taste them. The dough was thin and cooked very well in their brick ovens. A definite complement to the cheese, sauces, and seasonings. But all in all, maybe I had such massive expectations, that overall I thought this go around was just good. Nothing amazing. I really wanted to love everything, but it did not quite happen. I will be going back again.